You might expect the governor of New York to have some sort of rudimentary intelligence. That doesn't seem to be the case with Andrew Cuomo. After the Santa Fe, Texas tragedy, Governor Cuomo tweeted “DO SOMETHING” to President Trump. “Do Something” is something that would be bettered by most third graders: perhaps all of them. Now, really, just what piece of printed legislation could possibly have any effect on a 17 year old high school kid that decides to kill his classmates? We apparently have pipe bombs, various other IED attempts, and a couple of boringly utilitarian firearms, a revolver and a shotgun, stolen from Dad. The blood wasn't dry before wingnut media outlets proclaimed that this senseless tragedy was the product of assault weapons. 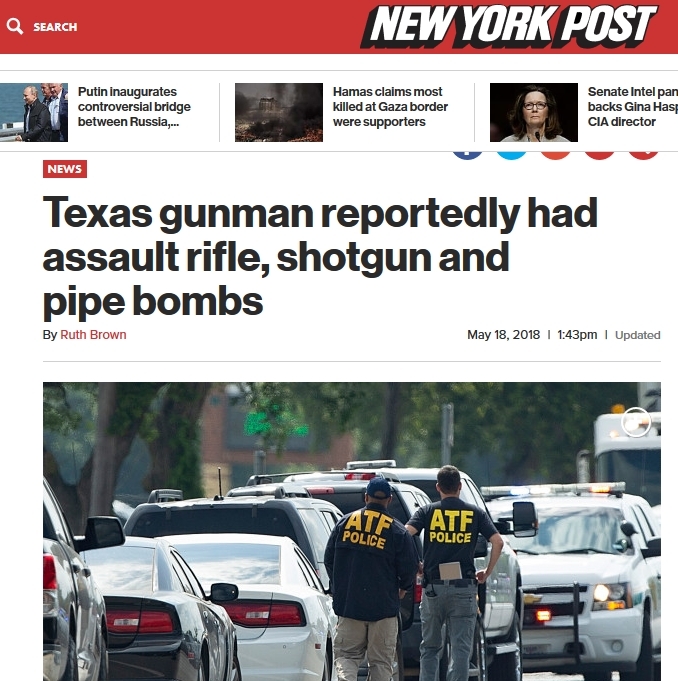 The New York Post and other lying media outlets couldn't contain themselves even for a few hours, before the “assault weapon” hysteria was shamelessly misreported. There are zero standards for what was once called journalism, for anything you wish can be “reportedly.” All too often, it is. Meanwhile, Chicago saw about 1000 car-jackings last year and there is no sign that it is slowing down. All you have to do is look it up. The Chicago Police Department last year solved fewer than one in five murders committed during 2016, the lowest rate for that crime in at least a half century, according to new police figures. Of the 763 murders tallied by police in 2016, the department “cleared” just 151 — or 19.8 percent — down from a 2015 rate of 25.4 percent, according to the figures, obtained by WBEZ using the Illinois Freedom of Information Act. If I suggested that Chicago does not prosecute people for committing murder, you might think that I was making some tasteless joke. The problem is that it is no joke, for 80% of the time murder is essentially legal in Chicago: meaning there are no consequences for committing it. We cannot stop the media from lying. Nor can we easily make pre-existing laws enforced, as in the case of Chicago where there is little effective enforcement of laws banning murder. We also cannot stop the media from making mentally and emotionally people famous. Infamy is hardly a new term, but media creates infamy. Jacqueline Helfgott, a professor of criminal justice at Seattle University, says that some research suggests that criminals get their ideas for their crimes from the media, and that there does seem to be an effect of the media on at least a subset of people. We cannot legislate 17 year olds into suddenly becoming better people. We cannot legislate away insanity, evil, derangement. Only a fool, like Andrew Cuomo, would come up with the juvenile, irrational, unbearably vague notion of “Do Something.” Just doing something is hardly the point: doing something that actually works is the challenge. "If violent crime is to be curbed, it is only the intended victim who can do it. The felon does not fear the police, and he fears neither judge nor jury. Therefore what he must be taught to fear is his victim."